The Vision Council is proud to release its 2018 Annual Report, highlighting the organization’s many accomplishments throughout the year. In 2018, The Vision Council welcomed 54 new member companies and saw the success of the first year of the Optical Retail Division (ORD). Now boasting over 45 member companies, the ORD elected an inaugural chair and vice chair in May, and after a national search, hired a staff liaison later that month. As the industry voice on Capitol Hill, The Vision Council’s Government & Regulatory Affairs Committee worked diligently to implement effective communication tactics to ensure members were kept up to date on crucial regulatory changes. These changes included updating the Chemical Management/Hazard Communication handbook and Prop 65 compliance education. The VisionWatch market research team continued to maintain the VisionWatch reputation as the source of superior industry research by publishing 180 reports, including 16 proprietary reports and two new reports. Notably, the new contact lens market research report gave an industry first look at the growing consumer interest in monthly contact lens subscription services. The Vision Council’s consumer campaign efforts—speaking to consumers and consumer-facing media about the importance of eyecare and eyewear, notably focusing on fashion/lifestyle, UV eye protection and digital eye strain messaging—garnered more than 1.7 billion consumer media impressions. Additionally, through continued support of the Think About Your Eyes campaign, the industry saw 3.95 million eye exams generated in 2018, resulting in $869 million in industry revenue. 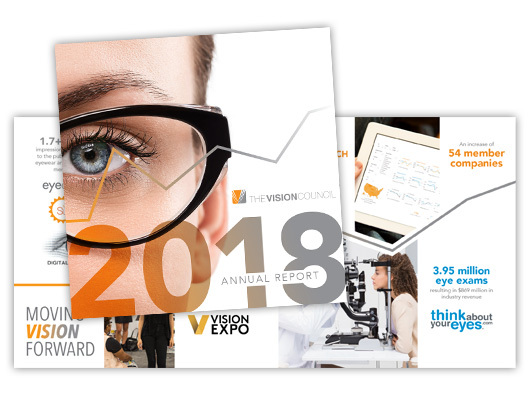 Finally, Vision Expo received a 16 percent increase in optician turnout compared to the previous year thanks to the introduction of OptiCon—the industry’s premier opticianry and contact lens fitters education program—and the debut of the OptiCon hub at Vision Expo West. Vision Expo also won the International Association of Exhibitions and Events (IAEE) Art of the Show Competition for the Social Media category for successfully and creatively promoting the Show via its social media channels, including Facebook, Instagram and Twitter. With unwavering support from the Board of Directors, Committee volunteers and staff, 2018 has proven to be a successful year for The Vision Council as it aims to move the industry forward. Find out more by viewing The Vision Council’s 2018 Annual Report.